The PC Enclosures (Design PC) offered by us are known for providing better IP Protection up to IP55-67. Our enclosures provide IP_ IP55-67 degree of protection of equipment in accordance with IEC 529 and BS 5490 standards. We manufacture the PC enclosures keeping in mind protection of PCs of all makes. They are made according to IEC 529 and BC5490 standards and can provide protection up to IP 55-67. They are water and dust proof which makes them tough enough to be used in factory environments as well. They are made using superior quality raw materials and our customers appreciate them a lot. We offer them at competitive prices. Standard base As per requirement. We are successfully ranked amongst the top notch entity offering a wide range of PC Enclosures. These enclosures are manufactured using cast iron, aluminium or stainless steel metal. Depending on the clients’ demands, the enclosures are built applying modern designs and sophisticated technology. Offered enclosures have a power socket, ventilations, and spacious drawers for placing printers, UPS, keyboards and other stationary materials inside. Such enclosures are developed applying modern sciences that help in keeping the inside temperature normal. PC Enclosure Economy (Sitting Operation). 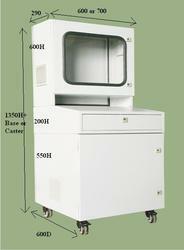 PC Enclosure Economy (Standing Operation). Shop floor PC enclosure (Sitting Operation). 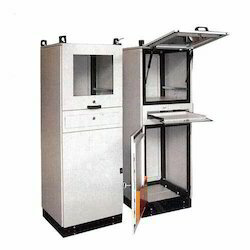 Shop floor PC enclosure (Standing Operation). 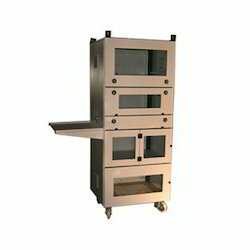 Shop floor PC enclosure with all facilities. Sliding drawer for the keyboard with high-quality telescopic rails with the arrangement for mouse pad below the drawer. 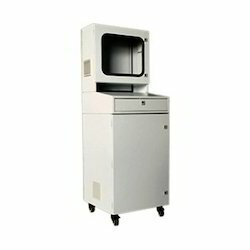 Since our inception, we are engaged in presenting a wide range of excellent quality PC Enclosures. These enclosures are manufactured using cast iron or stainless steel metal. Depending on the clients’ demands, the enclosures are built applying modern designs and sophisticated technology.The comfortable drawers, doors and side bar help in installing and uninstalling any hardware easily. These enclosures are equipped with glass windows and adjustable levellers. 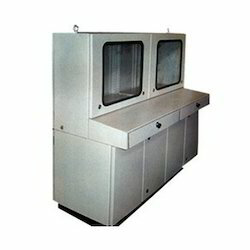 Besides this, clients can avail the enclosures as per the custom design at industry leading prices. All types of enclosures manufactured in mild steel or stainless steel. Leveraging on our in-house production unit, we are presenting a wide assortment of PC Enclosures. The applied ventilation technique helps in maintaining the temperature of computer, printers, stabilizer, and other heat generating device according to the room temperature. These enclosures look awesome and offer comfort to the users. The comfortable drawers, doors and side bar help in installing and uninstalling any hardware easily. These enclosures are equipped with glass windows and adjustable levellers. Offered enclosures’ height can be adjusted by adjusting the levellers provided below. With the assistance of our deft team of professionals, we are able to introduce a broad array of PC Enclosures. Provided enclosures are attached with wheels that help to move the box from one end to another comfortably. Offered enclosures have a power socket, ventilations, and spacious drawers for placing printers, UPS, keyboards and other stationary materials inside. 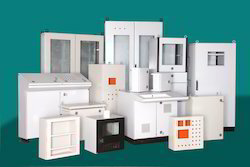 Apart from it, clients can avail the enclosures as per the custom design at industry leading prices. We specially devise the Shop Floor PC Enclosure display and protect the chip protocols device net, Ethernet/IP, EtherCAT, ControlNet and component. They are made according to standards IEC 529 and is 5490 and can provide superior protection up to IP 55-67. We manufacture it using superior quality raw materials which are why they are completely water and dust proof. They can be used in very harsh conditions as well. They keep the pc protected and in working condition for a long time. 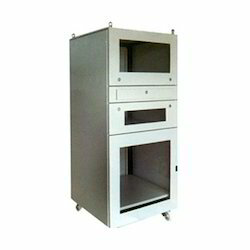 Our company is widely acclaimed in the manufacture and supply of Control Room PC Enclosure. We make them in such a way that they are highly protected. The protection offered is up to IP 55-67 and are in accordance with BS 5490 and IEC 529. They are dust tight and water proof and can protect your PC from factory type environments as well. They are low cost and are low on maintenance. They are easy to install and are user-friendly. Looking for PC Enclosures ?